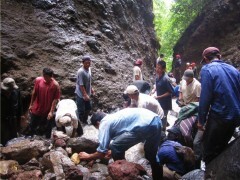 InanItah is part of the La Ciquena Water Cooperative, a cooperative of people working together to maintain a gravity fed water system along 4km of tubing to a region of Isla de Ometepe. Most members of the cooperative are subsistence farmers, so when lines break, they are able to provide the labor, but finding the financial means to make necessary repairs is very challenging. During the recent water crisis, almost 1300 ft of tubing was taken out by the storm. Because of the many generous donations that have been made to the La Ciquena Water Cooperative fund, there was enough financial support available to purchase essential repair parts. To make the necessary repairs, 1300 ft of new tubing had to be purchased, and it required a community effort of 25 co-op members working together for two days. The long-term plan for the La Ciquena Water Cooperative fund is to gain enough financial support to build a 70,000L ferrocement tank, which will provide drinking water for the entire community in emergency cases when the water lines break. If you would like to support this project, please use the donate button below. We are very grateful for your contributions! This entry was posted in Uncategorized and tagged aid, donate, projects, water. Bookmark the permalink. Your retreat space looks awesome.